I had been craving chocolate, more than usual, and I saw a show on the Food Network that used cayenne pepper in their chocolate sauce. This wasn’t a new concept to me, but one that I had never tried before and one I had to try really soon. I can’t remember the exact occasion, but it involved a night in with the hubby and culinary experimentation. I found a recipe on cookinglight.com that looked delicious, and not bad for the gut either, so I decided it was time to give this Souffle thing a try. I made the full recipe, 8 Souffles, but decided to split the batch up just in case I screwed something up. The chocolate sauce was very simple to make but the whipped egg whites didn’t turn out quite right. I put everything in the mixer and started whipping away. When the stiff peaks formed I started to slowly fold the mixture into the chocolate, but when I got to the bottom I noticed that my mixture had separated. I went ahead and mixed everything in hoping that it would turn out okay. 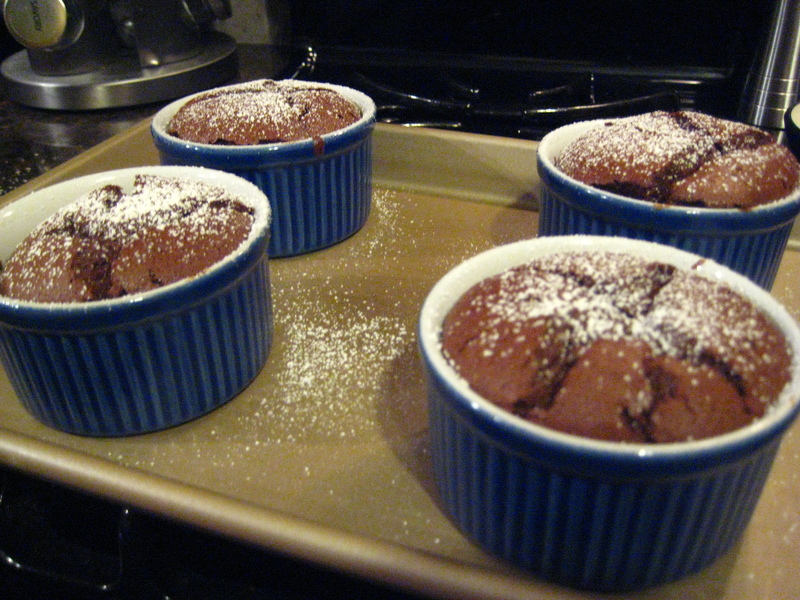 I put the mini souffles in the oven for the alloted amount of time (30 minutes) and waited to see them rise. I waited exactly until the timer beeped, then I pulled them out of the oven. Mistake 1: Letting the egg white mixture separate. Mistake 2: Letting the Souffles cool. They deflate immediately and do not look as pretty. Now I must say, the first batched tasted delicious. My only problem was that I wanted the center to ooze chocolate when I cut into it. If I would have pulled them out of the oven about 10-15 minutes earlier then they would have been perfect. I applied this technique to the second batch and VOILA…an oozing center of chocolaty goodness. A few weeks later I was watching Giada on the Food Network and she mentioned a technique that instantly made me realize why my egg whites separated. I didn’t chill the bowls! 😦 Chilling the bowl and mixing attachment beforehand will prevent the mixture from separating. It has become a tradition in my house to cook a large meal on Halloween, including dessert to add to our sugar commas from earlier in the day (about half of the candy for the trick or treaters gets eaten before). Why not go ahead and eat more chocolate! Hooray Halloween! We then snuggle up with a nice bottle of wine and watch our favorite Halloween movie, Tim Burton’s Sleepy Hollow. This year was no exception and the menu was delicious. Now I went ahead and split the recipe in half for the Souffles (I didn’t need eight this time that’s for sure) so I just had one batch to work with. This time I chilled the bowl and the whisk and the egg whites turned out beautifully. There was no separation and they folded perfectly into the chocolate mixture. I made the mistake, yet again, of over cooking them just slightly, but even though they didn’t ooze chocolate, there were still creamy and delicious! I can’t wait to attempt a savory souffle for dinner next time! I just love to watch them rise in the oven! Phoenix: This band is definitely not new to the music scene but they are new to me and I am really loving their new album, Wolfgang Amadeus. From start to finish the album delivers and eclectic mix of fun beats and lyrics. 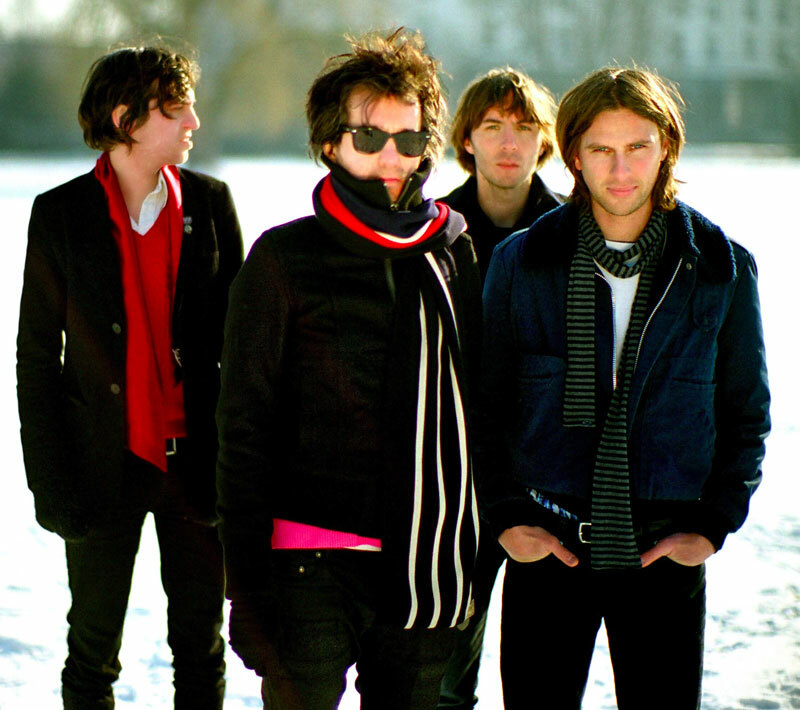 Check out the video from the Frenchmen below for their single Lisztomania. Click the pic to view the video on YouTube! Love the photo of your souffles, they are beautiful! Would love to try this but may most likely have to wait for a treat from my daughter! Love the video, makes me want to travel to far off places and eat wonderful food! Um excuse me? But I have a spoon that would go well with this dessert. Come on over to Half Hour Meals and visit us!!!!! your souffles look so good. i just finish making mine and i noticed that the souffle split, i suppose you’ll call it like the top part of the (choc) souffle was a pale brown while the bottom half was a hard color. What do i have to do to stop this happening. It tasted great but just wondering why this happened? Should i cook it longer?